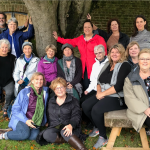 The 2016 Discover the North tour started in Dublin today as our 18 guests arrived at Dublin Airport from many parts of United States and Canada. 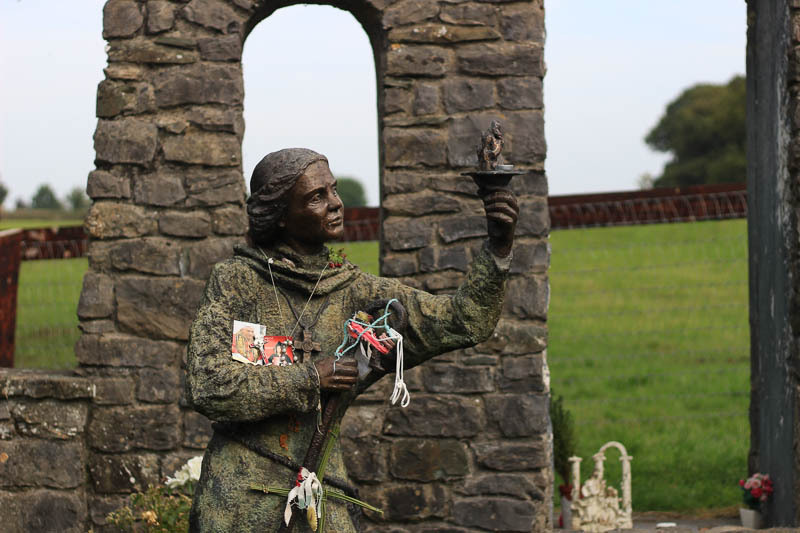 One of our favorite places to take guests on the first day is to Solas Bhride – a center in Kildare run by Brigidine sisters who provide a warm welcome and the blessing of St. Brigid. Our guests gathered for the first time as a group today at 1pm for a short meeting. Then we boarded our bus in the rain. It was a damp, dreary day. But the dismal atmosphere lifted when Sister Phil and Sister Mary met at the door of this Christian spirituality center that welcomes people of all faiths and of no faith within the context of the Solas Bhride vision to unfold the legacy of St. Brigid and its relevance for our time. I can’t think of a better place in Ireland for bringing people together for the first time. 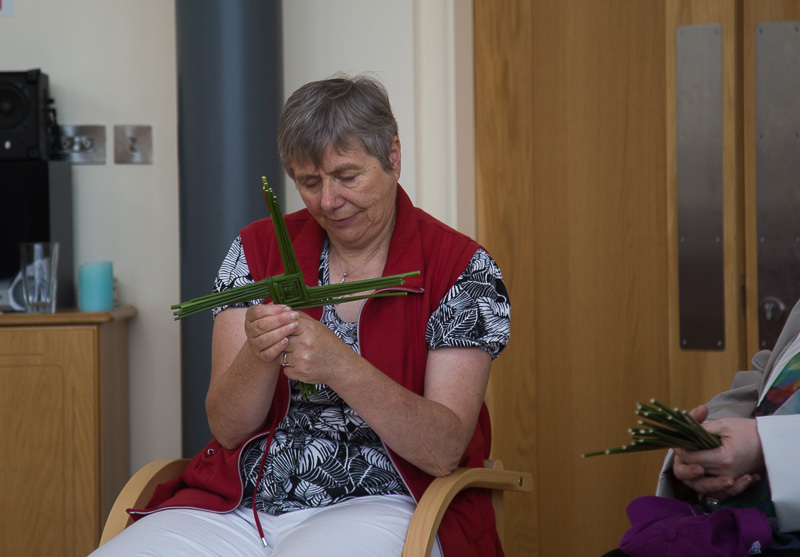 After a brief tour of the center, Sister Phil arranged the group in a circle and wove a cross of St. Brigid. 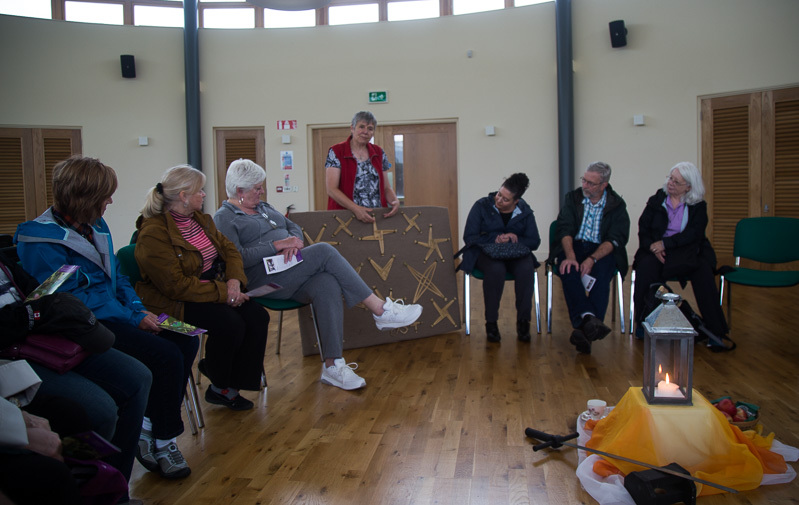 With each rush she wove into the cross, she asked the group what they would like to “weave” into their journey this week. As members of this newly formed tour group called out things like friendship, forgiveness, humor, love, respect, St. Phil added a rush to the cross – each rush representing a hope for the journey. 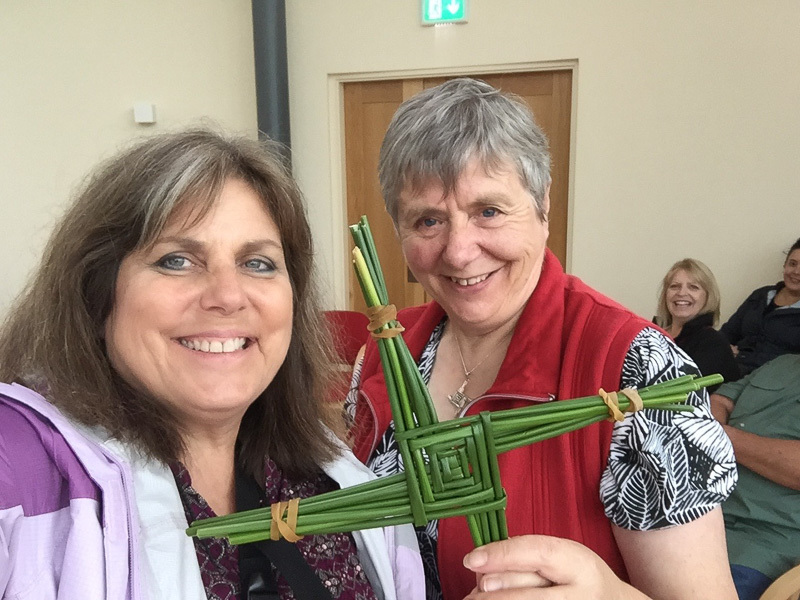 At the end she presented me with the cross, and we’ll keep it on the bus in plain sight as a reminder of the blessings received at Solas Bhride…. as we move through these coming days together. So we’ll shift that bit and substitute the word “bus” for home and keep at a point of focus on our journey together. After Solas Bhride (means the light of Brigid), we went around the corner to “Tobar Bride” – St. Brigid’s holy well – a site of local pilgrimage where the water from a holy well runs out to little spring that flows around a small island with a bronze statue of St. Brigid holding a crozier and a flame. (see image above) The peace is palpable in this place. 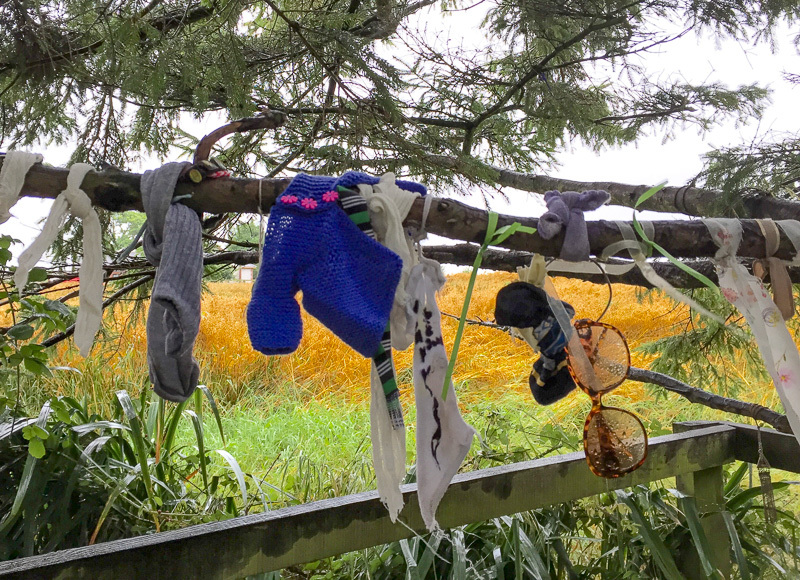 There’s a clootie tree by the well (sometimes called fairy tree or rag tree) where pilgrims leave tokens of devotion – something that represents an intention left behind. Today was an interesting array of clooties. I still believe that every person on our thin places tour was called to that particular tour for a reason. We all have been called to be a collective part of the “whole” that will make up this tour. The first day is always a prayerful time for me. I pray everyone is blessed, inspired, enlightened and celebrated. 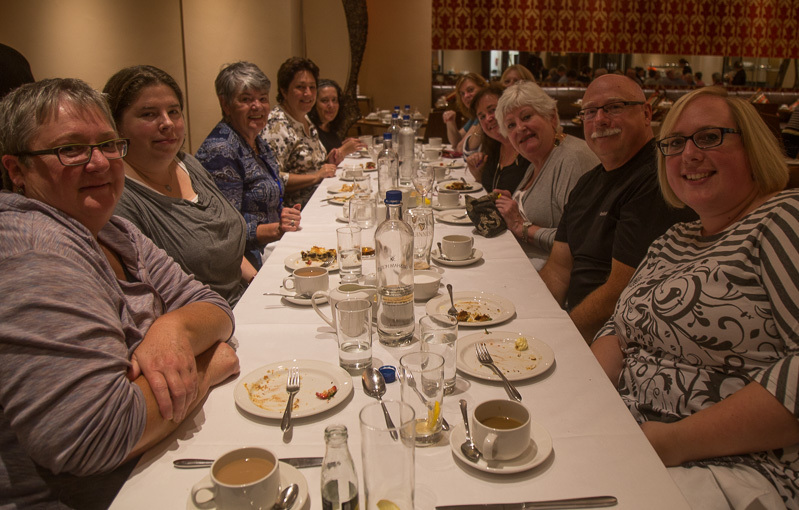 So Dan and I welcome you all – Julie, Suzanne, Karen, Richard, Cheryl, Don, Tricia, Anita, Marianne, Kathy, Moyra, Karen, Eleanor, Sally, Jen, Ann, Ruth and Danny. 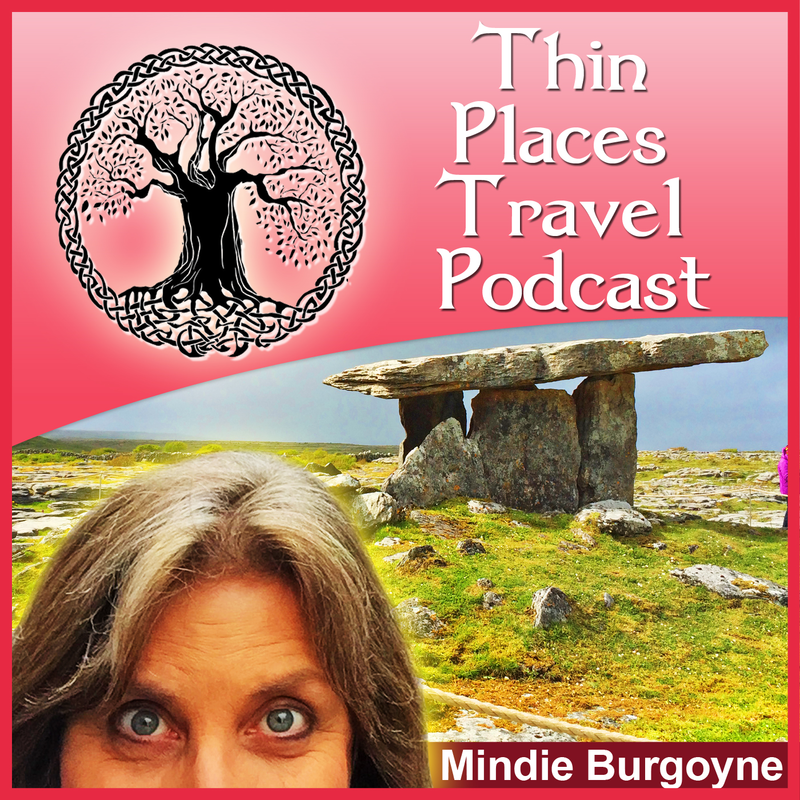 Here’s to Ireland, new friends, new discoveries and thin places. Thanks for the kind words, Kathy. I so loved getting to know you and having you on the tour. It’s good to know that the experience was a profound one for you. I look forward to seeing you again. Blessings on you.